This is the story we tell when we go to Joe’s Shanghai. One time, not so long ago, Mommy and Papi got married. It was Saturday, September 15th, 2001. And just a few days before that — on Tuesday, September 11th, 2001, something very horrible had happened in the United States. It was “9-11” and it was when the airplanes crashed the twin towers in New York City. Papi was right there, going to work that day, and saw horrible things happen. And many of our friends were there too. But lucky for us, nobody we loved died or was injured. Except, the tragedy was, many, many, many people died and many lives and families were devastated. 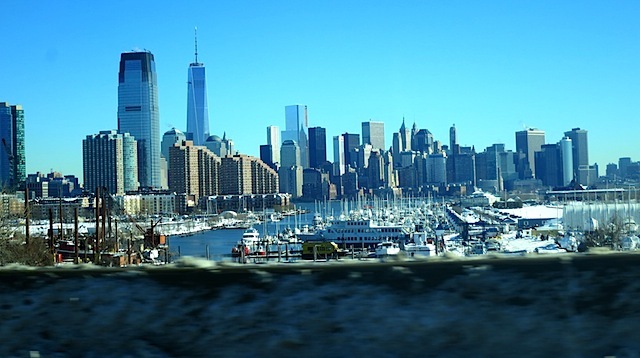 In the town where we lived in New Jersey, very many people died. It was a heartbreaking time where we lived, and in our whole country. It was also a heartbreaking time to get married — that weekend the airports were still shut down, so lots of our friends — some of our very closest friends — could not make it to our wedding. It was really sad. Especially for Mommy. The next week — it was the first weekend after the Saturday that we were married — we were back in our house in New Jersey, where we lived then. On t.v., the mayor of New York City announced to the whole country that New York, New York was “open for business,” and he asked that people “come back to New York.” And so Mommy and Papi decided to do what he was asking. We took the train into the city to spend the day. It was hard to see the New York City how it was then. There was smoke and ash everywhere, and the whole place was practically deserted, and there was a terrible mournful smell and feeling in the air. It felt like a very unfamiliar version of The Big Apple. We went out for coffee, and browsed some shops, and bought tickets to see a Broadway show (42nd Street — it was awesome! ), and we decided we’d go out for lunch before the play began. 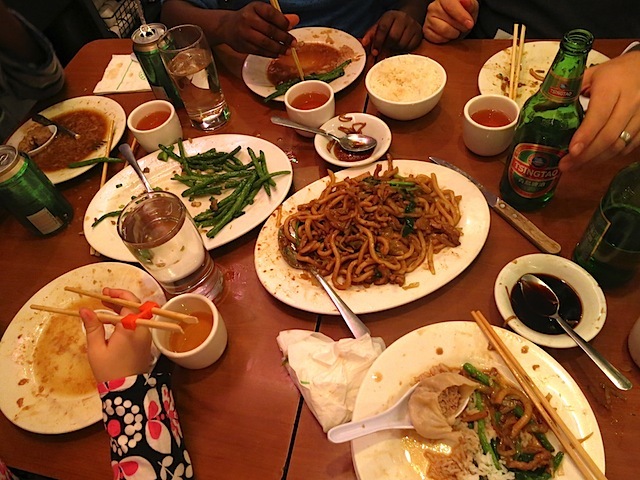 We wanted to eat in Chinatown, but had never found a restaurant there that we loved. We asked a Chinese man, in a subway station, for a recommendation. “Something real, not touristy,” we said. “Someplace authentic, someplace you’d go with your family,” we said. He looked at us very skeptically. “Are you sure?” He asked. “Yes, we’re sure,” we said. So he told us: “Go to Joe’s Shanghai. 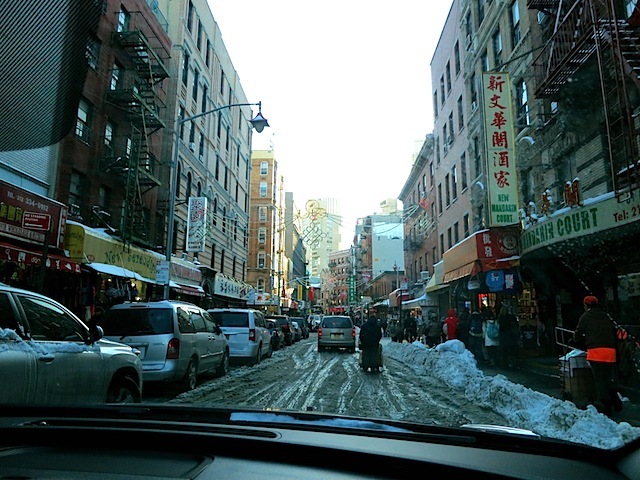 Get the soup dumplings.” He gave Papi the address and we headed straight there. We were seated at a big round table, way in the back. At first, it was just the two of us at the table. But within 10 minutes, the table was filled with six other people — all firefighters, all covered in thick ash and dust, all smelling like a sickly smoke. We were stunned. We knew right away they were working at the 9-11 site. And sure enough, they started talking about it to us, telling us a bit of their stories, explaining to us about a little bit of what was going on at “Ground Zero.” And it was heart wrenching and incredibly inspiring to have lunch with those firefighters that day at Joe’s Shanghai. We all ordered soup dumplings and there were many steamer baskets of the gorgeous little dumplings all around the table. We ate soup dumplings and talked some of the time, and also ate soup dumplings and were quiet some of the time. 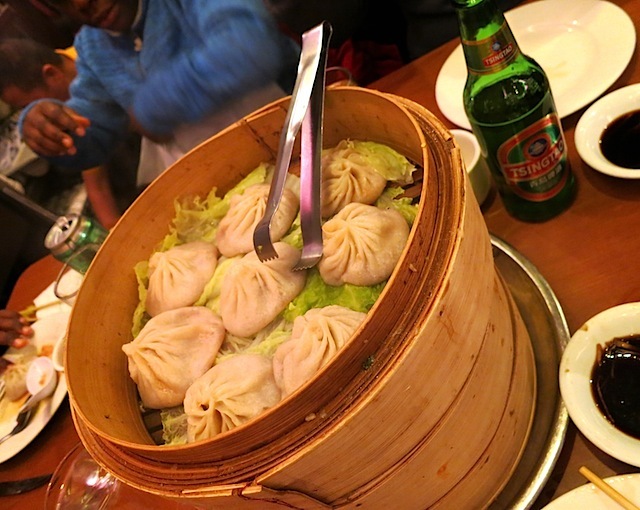 We all marveled at how amazingly good those soup dumplings tasted. I felt like I had never had anything so delicious in my entire life. The service was impeccable. And other than us and the firemen, everyone in the whole restaurant was Chinese. 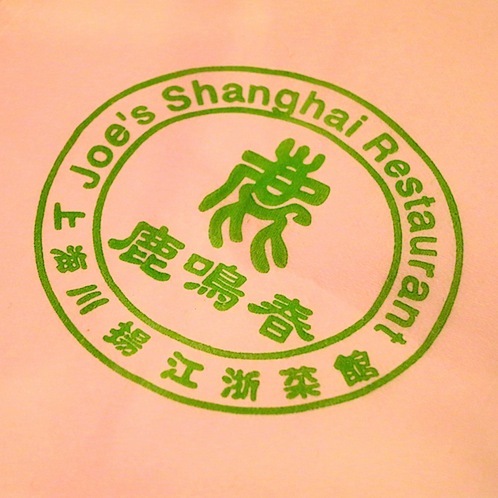 That was when we first fell in love with Joe’s Shanghai. And we started going to Joe’s Shanghai every chance we got. It wasn’t long after that we started daydreaming of starting a family, and we’d often talk about the kind of life that we wanted to have, and we’d laugh about how we couldn’t wait to take our kids to Joe’s Shanghai, and places like it. And soon, Kyle and Owen came home, and our family life got started. 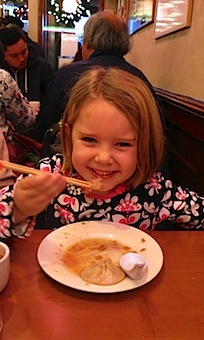 We first took K & O to Joe’s Shanghai when they were babies (before we even started the blog; when they weren’t even 2 yet; it was one of the first restaurants they went to). 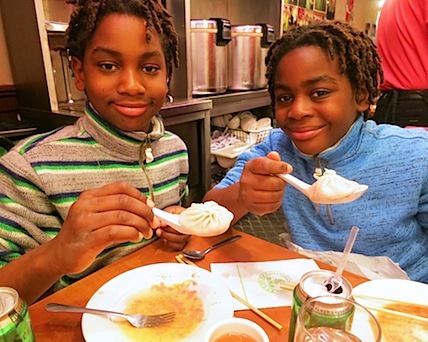 Our three bambinos have been eating soup dumplings at Joe’s Shanghai their whole lives. It is one of our happiest and most favorite things to do as a family. Today we went into the city. It was so cold, and there was snow and slush everywhere. 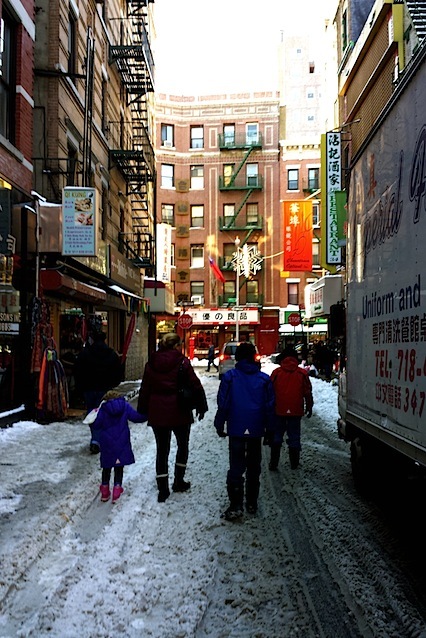 We made our way to Pell Street and it was our 2nd shortest wait ever at Joe’s Shanghai (the first shortest wait was the day Papi and Mommy first went; the second shortest wait was today — only 15 minutes! — it is usually at least 50!). Within 2 minutes of sitting down, we had what we went for. The soup dumplings. Today we had 5 baskets of them! Our new record! Plus our other two favorites: the String Beans, and the Shanghai Flat Noodles. After, we did what we always do: we browsed the vendors on the sidewalk (we bought Meera a Chinese fan and a plastic baby doll; Kyle and Owen announced that they have “outgrown wanting anything from the street shops” — which is just fine with us). 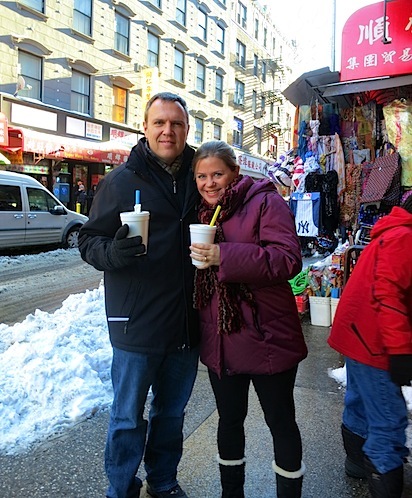 We browse on our way to our favorite Bubble Tea shop — we always have to get the Chinese Boba (tapioca ball tea)! It was winter, so we got it hot. In the summer, we get it cold. And today, something new! Kyle eyed someone eating something that looked good. Mommy found out what it was — Chinese Mantou — fried sweet buns with condensed milk for dipping. We got some to go, and it was an instant dessert hit for us all — K & O especially. And so, a new tradition begins — Mantou on the street, with our bubble tea, after Soup Dumplings at Joe’s Shanghai. Hi guys! This is totally off topic, but we are planning a vacation to the DR this spring and I really want to check out the hotel you guys traveled to a few years ago-I looked on the blog, but did not see an actual name. Would you mind passing that info along? We’re going to take side trip to Haiti and hopefully meet bio parents. . . its going to be a very intense trip and I want us to have a place to really unwind afterwards. Your photos of the Hotel looked lovely! Thanks in advance! The only problem with the Dreams La Romana is that it is a bit of a ride away from the Punta Cana airport (if I remember, it is over an hour). For us, that was great (we got to see some of the ‘real’ DR), but given that you’ll have spent time in Haiti… you might want to think about staying closer to Punta Cana. Before we had kids we traveled to resorts in the Punta Cana area, and they were wonderful. Something to think about. If you do choose Dreams La Romana, I’m sure you’ll love it– we thought it was a great bargain for a higher-end all-inclusive in the DR.
Keep me posted on what you plan so that I can live vicariously through you!!! Thank you! And I will ! I love this post!! Great memories to document! And wow I hadn’t heard of Mantou before. Here they have Steamed white buns called Baos filled with Red bean paste, Custard paste or savory meat fillings. I’m always amazed how many Dimsums you guys can eat! !